Butter Toasted Peanuts for sale. Buy online at Zingerman's Mail Order. Gourmet Gifts. Food Gifts. 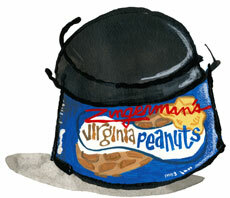 Big, fat, fried, salted Virginia peanuts are fine enough on their own. We should all be content to eat them as is. The folks at Virginia Diner, however, have taken them one step further. They coat them in butter and sugar. The butter forms a crispy, caramel-like jacket. The sugar sweetens them just a little. The result is painful, impossible to stop eating and should be illegal. Consider yourself warned.